Description: The 1996 Olympic Torch Relay train makes its circuitous way to Atlanta, Georgia. Union Pacific SD40-2s 1996 (ex-3339) and 1896 (ex-3316) are on the head-end as it climbs Beaumont Hill in southern California. Description: Olympic Special in the Amtrak depot. Don't remeber the date. Description: On display in Old Sacramento, Ca. Description: In 1996, the UP was a major sponsor of the Olympic Torch Relay and this special display train visited many parts of the UP system. 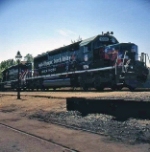 Description: The UP's "Torch Train" stops at the Okalhoma City Depot. Description: A closer view of UP #1996's special paint. Description: UP 1896 and 1996 have come to Fort Worth but the Olympic Torch train was not in tow. I believe these two locomotives ran around in this scheme for several years after the Olympics. Description: UP 1996 with a fast approaching thunderstorm. Description: Union Pacific SD40-2 3316 was renumbered to 1896 and repainted for use on the train that carried the Olympic Torch to the games in Atlanta in the summer of 1996. UP 3339 was renumbered to UP 1996 on April 7, 1996 (after rebuilding in-kind) to commemorate the 1996 Atlanta Summer Olympic Games; renumbered to UP 3101 on October 20, 1996.